Remote S was made by a third party but offers features that we might expect from an app put out by Tesla itself. Its many features include the ability to start the car from your wrist as well as the power to summon your car to you when you’re not near it, and view “breadcrumb tracking” to determine where the car has recently been. Other key features include the power to lock and unlock the car, adjust the HVAC system, honk the horn, flash the lights, and starting and stopping charging for the vehicle. Tesla also has its own app; however, that app is currently not compatible with the Apple Watch. So, if you want to use your Apple Watch you’ll have to branch out into the third-party version. BMW’s i Remote app only works with the company’s i3 and i8 vehicles. Once paired with your vehicle, the app can display the current status of your car’s battery as well as information about whether you’ll be able to reach your current destination on your battery’s current charge. Also built into the Watch app are a few other standard car app features, such as the ability to lock and unlock the doors and control the HVAC system. Hyundai’s Apple Watch offering isn’t limited to just the company’s high-end vehicles. 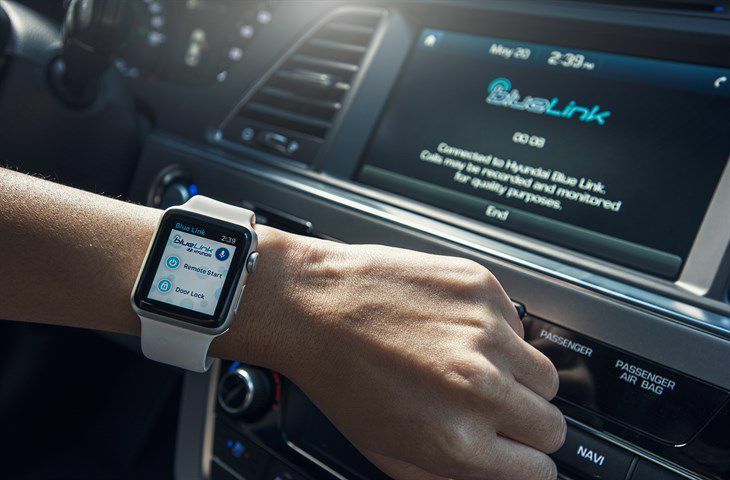 With Hyundai’s Blue Link you can control any Hyundai vehicle equipped with Blue Link and made after 2013. With the app, you can lock and unlock your vehicle as well as remote-start your car on a cold morning, or activate the lights or horn on your car. Hyundai also offers a similar app for Android users who are using a Wear OS (formerly Android Wear) smartwatch. Remotely start your vehicle (R). Remotely unlock or lock doors (R). Remotely activate the horn and lights (R). Search and send Points of Interest to your vehicle (G). Access saved POI History (G). Make a Car Care service appointment. Access Blue Link Customer Care. Access maintenance information and other convenient features. Check vehicle dashboard statuses, such as fuel or battery level, trip meters, and more. Control your fuel-fired parking heater, if the vehicle is equipped with a fuel-fired parking heater. Control your cabin climate, if the vehicle is a plug-in hybrid. Locate your vehicle on a map or use the vehicle signal horn and blink indicators. Check the current status of doors, windows, and locks for your vehicle. Lock and unlock the vehicle remotely. Request roadside assistance from within the app. Edit your driving journal, categorize trips as ​business or private, merge trips, rename and send to an email contact. Analyze your trip's route with map view and statistics such as fuel and/or battery consumption, as well as speed.